Franklin Graham told the crowd about his mother, Ruth Bell Graham, who grew up in China where her parents were missionaries. Her family spent a lot of time in Japan as they traveled to and from the United States. “As a little boy, she told me stories of Japan,” Franklin said. Now he has his own stories to tell about a wave of new believers in this largely non-Christian country. It’s autumn in Tokyo and the leaves are changing—red, orange, yellow and brown. “You’re seeing everything different, in new colors,” singer Lena Maria Klingvall said onstage Sunday, facing rows and rows of people in the arena. And that’s what it’s like when you make Jesus part of your life, she added. It was the final day of the Greater Tokyo Celebration of Love, and unlike Lena, the people who came were having a hard time finding words to describe it. 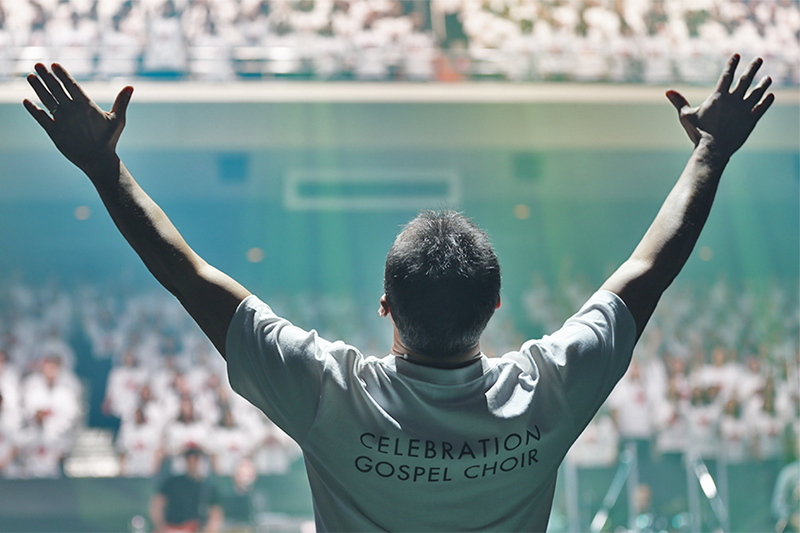 How do you convey the power of the enormous Japanese gospel choir that took up two tiers in the historic Budokan? Or the raw emotion so openly expressed by people who typically hide the way they feel? As one pastor said, this was no ordinary Japanese event. Japanese Christians make up a tiny portion of the population—reportedly less than 1 percent—so the churches don’t exactly have a big presence in everyday life. But Sunday, Pastor Shizuo Satou said, they made a splash with so many coming together to boldly show their faith in Christ. He’s confident the three-day Celebration will create a wave throughout the country—starting with people like Mr. and Mrs. Mineshima, a couple who has been coming to his church. The Mineshimas were married in January, and the wife, a Korean Christian, had been praying for her Japanese husband to discover Jesus Christ as she had. They sat with Pastor Satou Sunday afternoon, and when Franklin Graham gave an invitation for people to come forward and accept Christ, the pastor turned to Mr. Mineshima. “Are you ready to make a commitment to Christ?” Satou asked him. He was, and at the tail end of the Celebration, Satou found himself praying over the couple, the husband emotional, the wife crying and clinging to her husband’s arm. Prayers had been answered. “I wanted to believe,” Mr. Mineshima said minutes later. He was moved by the message and the music, he said, adding that although he’s over 50, he’d like to turn his life around. Nineteen-year-old counselor Tanno Kazuho connected with the man and will follow up with him in the coming days. People need something solid to believe in, said Kazuho. The Japanese have so much uncertainty in their lives, so many worries, he said, but internalize it so they don’t show their weaknesses. Many also grow up with no faith at all and rely on themselves to get through life’s ups and downs, Satou said. The Celebration was a great way for them to hear about a Creator, he continued, One who loves them and wants to be part of their lives. But as Franklin Graham told the captive crowd, God knows everything about them. It’s not often Japanese bare their souls to another person. But Sunday, many discovered God’s mercy and couldn’t hold back tears. Franklin spoke to his wife earlier in the day and said her aunt had passed away suddenly. Michael W. Smith, who was scheduled to perform at the Celebration all three days, had to leave early to be with his family as his father passed away. Everyone dies, but no one knows when, Franklin said. Franklin read from Mark 8:36: For what does it profit a man to gain the whole world and forfeit his soul? That being the fate of their soul. In a society where people already feel the pressure of measuring up, the added weight of sin may be too much to bear. “Will you come to Him tonight?” he asked, making a genuine plea for the 12,000-plus listening in the arena. “I wish there were more events like this,” Pastor Satou said. In the meantime, he said, this weekend has opened many Christians’ eyes to the responsibility of telling others about Jesus. The goal, after all, isn’t a three-day revival but a revival that continues on indefinitely, reaching more and more people with time. Earlier in the week, Franklin said his father asked Christ into his life as a teen at a small revival. God has used Billy Graham ever since to impact millions of people worldwide. 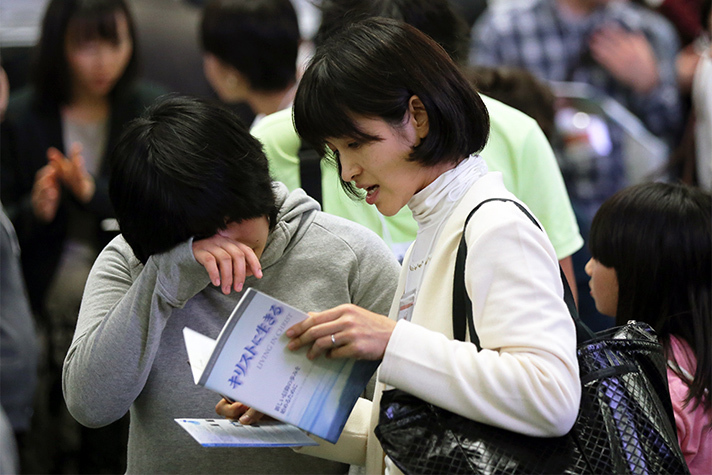 You never know how God may use the new believers in Japan, Franklin said. Ready for a new beginning with Jesus? Start your journey with Him today. 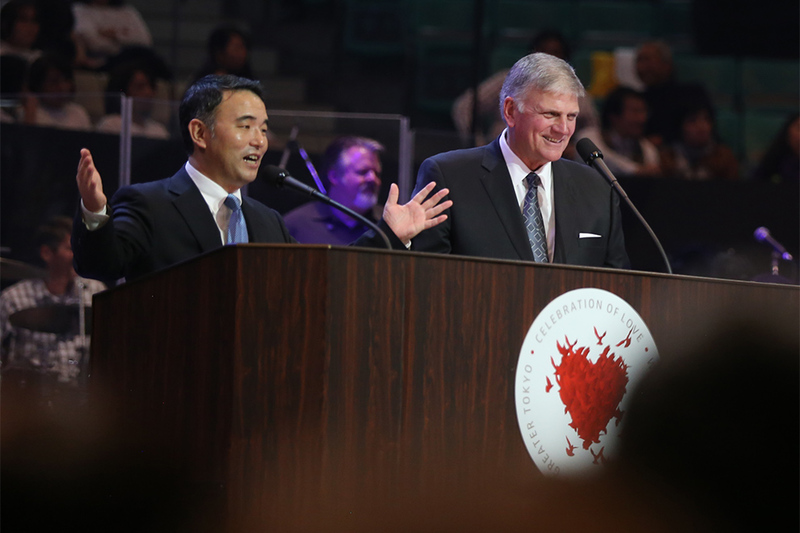 Nearly 13,000 people came to hear Franklin Graham preach Sunday afternoon in Tokyo. Over 38,000 attended the three-day Celebration overall, with more than 1,400 making decisions for Christ.